In a significant development, 47 top institutions in the country including the IITs and IIMs as well as the central university will be exempted from faculty reservations. The job reservations for SC/ST citizens in India so far has been through a bunch executive order. In the last session, the ruling United Progressive Alliance (UPA) introduced a bill to provide a framework for job quotas. 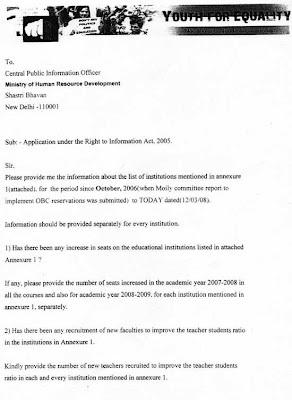 But the HRD ministry informed the IIT council today that the bill will not include India's premier institutions. The HRD ministry informed the council in a meeting that their long standing demand to exempt IITs and IIMs from faculty reservations has been met. The UPA in the last session has introduced as bill in Parliament to provide statutory framework to quotas in jobs. The bill is now with the upper house, the Rajya Sabha. HRD ministry has informed that the bill will exclude 47 top institutes including IITs, IIMs and NITs as well as all central universities, from reservations. The bill is called SC/ST Post Resevation Bill, 2008. The Prime Minister had gone to IIT Guwahati last year where the institute made a representation aganst quotas in the faculty of these premier institutes. the demands of the anti-reservation lobby. Remember, Together we can bring a change in the society and we will!! KOCHI: A Dalit convention being organised by the Communist Party of India (Marxist) here on Saturday will make a forceful demand for reservation of jobs for Scheduled Castes and Scheduled Tribes in the private sector. The reservation issue will top the 17-point charter of demand to be adopted at the meet, which will be held at the Harkishan Singh Surjeet Nagar in the Jawaharlal Nehru Stadium at 2 p.m. CPI(M) general secretary Prakash Karat will open the convention. An array of senior party and government leaders, including Chief Minister V.S. Achuthanandan and party State secretary Pinarayi Vijayan, will attend the convention, billed as one of the largest Dalit conventions in the State. The meet aims to politically energise the Dalits and enable them to assert their rights within Kerala's mainstream politics. Minister for Welfare of Scheduled and Backward Communities A.K. Balan, who is the chairman of the reception committee, told The Hindu that job reservation in the private sector was crucial for the economic emancipation of the Scheduled communities in the times of globalisation. He pointed out that job opportunities were fast shrinking in the government sector and public-sector undertakings. This had affected the Scheduled communities badly, as they were not yet able to compete with general-category job-seekers. Mr. Balan said strong pressure needed to be put on the Union government for a constitutional amendment to facilitate reservation. The private sector job reservation was on the agenda of the party and the last congress had discussed it. The meeting would also press the government to identify extra land holdings and allot them to Dalits on a war-footing to solve Dalit landlessness. A major issue that will be discussed at the meet is measures to secure higher education and professional training for the Scheduled Castes community. Though the Dalits were mostly literate now, they lagged behind in terms of higher education and professional education. Mr. Balan said there was nothing wrong in the CPI(M) organising a Dalit convention and this did not mean that the party was abandoning the class war and promoting caste-based struggles. Organising depressed communities to enable them to assert their rights and fight for their demands was a party policy. Conventions of converted Christians would be the next, he said. He ruled out any plan to launch a Dalit-specific organisation. The Dalit issue would be tackled within the mainstream political space of the party. He also denied that the CPI(M) Dalit convention was a response to the Chengara agitation where the party was on the defensive. Elaborate arrangements, including closed-circuit television, have been made at the convention venue. The main stage for the meeting has been designed by film director Shaji N. Karun. About a lakh people are expected to show up for the convention, party sources said. Indrajaal or illusion is when you perceive a rope as a snake or vice versa. One of the greatest indrajaal of present time can be experienced in Tamil Nadu where Dravidian fascism is being marketed as 'social justice'. Tamil Nadu model of reservation has virtually robbed the minority general community of their dignity and right to life/livelihood and has lead to their disenfranchisement. Analysis of an entrance results or appointment is sufficient to prove it. Current reservation in Tamil Nadu: Backward Classes ( BC) 23%, Backward Classes Christians (BCC) 3.5%, Backward Classes Muslims(BCM) 3.5%, Most Backward Classes/ Denotified Classes (MBC/DC) 20.0%, Scheduled Castes (SC) 18%, and Scheduled tribes (ST) 1%. Total reservation is 69%. Remaining 31 % seats belong to Open Category (OC). All above mentioned communities and general non-reserve 'Other Communities (OC) ' can compete for this open category. Distribution of remaining 1368 seats was as follows: BC (312), BCC (48), BCM (48), MBC/DC (275), SC (247), and ST (13). The remaining 425 seats were for Open Category. In Open Category, about 89% seats were taken away by reserved candidates: BC (244), BCC (28), BCM (18), MBC/DC (60), SC (27), and ST (1). The General candidates (OC/OC) could get only 47 seats out of 1368 seats, i.e. only 3.4% seats. General candidate could get only 47 seats out of 425 open seats, i.e. only 11.0% seats. Backward Classes (BC+MBC + BCC + BCM) took away 350 seats in Open category, i.e. 82.5% of open category. In first 50 ranks, only 3 belonged to general, non-reserved communities. Remaining 47 seats were taken away by Backward Classes. Even SCs captured 27 seats in Open Category and could make about 60% of non-reserved general candidates. Karan Thapar: Do you personally also, as Minister of Human Resource Development, believe that a reservation is the right and proper way to help the OBCs? Karan Thapar: In which case, let’s ask a few basic questions; we are talking about the reservations for the OBCs in particular. Do you know what percentage of the Indian population is OBC? Mandal puts it at 52 per cent, the National Sample Survey Organization at 32 per cent, the National Family and Health Survey at 29.8 per cent, which is the correct figure? Karan Thapar: Absolutely, Parliament has taken a view, I grant it. But what people question is the simple fact - Is there a need for reservations? If you don’t know what percentage of the country is OBC, and if furthermore, the NSSO is correct in pointing out that already 23.5 per cent of the college seats are with the OBC, then you don’t have a case in terms of need. Arjun Singh: I have said what I had to say and the point is that it is not an issue for us to now debate. Arjun Singh: So far as I can see, it is a closed chapter and that is why I have to implement what all Parliaments have said. It says that looking at the Delhi University, between 1995 and 2000; just half the seats for under-graduates at the Scheduled Castes level and just one-third of the seats for under-graduates at the Scheduled Tribes level were filled. All the others went empty, unfilled. So, again, even in Delhi University, reservations are not working. Karan Thapar: Fifty years after the reservations were made, statistics show, according to The Hindustan Times, that overall in India, only 16 per cent of the places in higher education is occupied by SCs and STs. The quota is 22.5 per cent, which means that only two-thirds of the quota is occupied. One third is going waste, it is being denied to other people. Arjun Singh: As I said, the kinds of figures that have been brought out, in my perception, do not reflect the realities. Realities are something much more and of course, there is an element of prejudice also. Karan Thapar: I put it to you that you don’t have a case for reservations in terms of need; you don’t have a case for reservations in terms of their efficacy, why then, are you insisting on extending them to the OBCs? Karan Thapar: Let’s approach the issue of reservations differently in that case. Reservations mean that a lesser-qualified candidate gets preference over a more qualified candidate, solely because in this case, he or she happens to be an OBC. In other words, the upper castes are being penalized for being upper caste. Arjun Singh: Nobody is being penalized and that is a factor that we are trying to address. I think that the prime Minister will be talking to all the political parties and will be putting forward a formula, which will see that nobody is being penalized. Karan Thapar: I want very much to talk about that formula, but before we come to talk about how you are going to address concerns, let me point one other corollary - Reservations also gives preference and favor to caste over merit. Is that acceptable in a modern society? Now take a moment to congratulate Karan Thapar for skillfully exposing Arjun Singh for the clueless dolt he is. BEGUSARAI/PATNA: A trial court on Tuesday convicted controversial Lok Janshakti Party MP, Surajbhan Singh, for killing a farmer over a land dispute 16 years ago. He is the third MP from the state to be convicted. Apart from the three, a former MP and a former state minister — making it a total of five politicians — have been convicted by different Bihar courts in recent years. Shibu Soren, an MP from neighbouring Jharkhand was convicted of murder, but later acquitted. Fast-track court judge Ravi Prakash Dhar Dubey found Surajbhan, MP from Balia, and two others — Jai Ram Singh and Radhe Singh — guilty of murdering Rami Singh of Madhurapur village in Begusarai in January 1992. Special public prosecutor Shyameshwar Dayal said the Begusarai court will hear the prosecution and defence on Wednesday before deciding on the quantum of punishment. Trials are on in at least five other criminal cases against Surajbhan. There was an uneasy calm inside the courtroom with the MP, in white shirt and trousers with a tilak on his forehead, standing quietly in the dock when the verdict was delivered. It was a long, eventful trial and the Patna high court had to intervene to complete it within a timeframe. But the fast-track court's bid to expedite things received a setback when prosecution counsel Ram Naresh Sharma was murdered in November last year. Subsequently, Dayal, a Patna HC lawyer who was appointed by the state government as special public prosecutor to oversee all other cases related to the MP, took charge of this case as well. The sitting MPs who have been convicted are: Pappu Yadav (Purnea), Mohammed Shahabuddin (Siwan), both from RJD; and Anand Mohan Singh, a former MP from Sheohar. Anand Mohan was sentenced to death for the lynching of then Gopalganj DM, G Krishnaiah. Shahabuddin has been convicted in at least three cases. He was given life term for kidnapping CPI-ML worker Munna Choudhary with the intent of murder. Pappu got life term for the murder of CPM MLA Ajit Sarkar in 1998. Former Bihar minister in Rabri cabinet, Aditya Singh, and his son are in jail for killing two persons in Nawada. If the law is catching up with the state's dons-turned-politicians, it has more to do with the Nitish Kumar government's move to ensure speedy trial in criminal cases. After these cases, including those against politicians, were transferred to fast-track courts some two years ago, 6,000-odd criminals have been convicted by various courts. Starting off as a contract killer for UP mafia don Shriprakash Shukla (killed in an encounter by police) in the early 1990s, Surajbhan has of late been controlling most railway contracts and other PSUs in Begusarai and surrounding districts. Feared as a crack shooter who kills in cold-blood, Surajbhan in the mid-1990s led upper caste criminals in retaliatory violence against backward caste goons. In 2000, he was elected MLA from Mokama and his political clout helped him bag more contracts. Are our leaders law abiding citizens? Nearly a quarter (23.2%) of the MPs has reported criminal cases against them. One out of two among them (over 50%) have cases that could attract penalties of imprisonment of five or more years. The states of Bihar, U.P., Jharkhand and Madhya Pradesh that account for over 50% of the MPs with the high penalty criminal cases. Though with Supreme Court order, it has become mandatory for candidates to declare the cases pending against them, it has hardly discouraged the political parties from nominating known criminals as their candidates. According to ‘Election Watch" in Bihar assembly election (2004-2005), each major political party has fielded 30% to 40% candidates with criminal background. The affidavits submitted by candidates just make some news headlines in English media. The information hardly reaches the voters. Ignorance of voters, caste and communal equations, large scale intimidation of voters and absence of middle and upper classes from voting make this declaration virtually ineffective. The problem becomes worse when all the major candidate in a constituency have criminal background. In absence of negative voting, one of them is definitely going to be elected. Several organizations have repeatedly demanded that any person charged with any offence punishable with imprisonment for a maximum term of five years or more, should be disqualified for being chosen as or for being a member of Parliament or Legislature of a State till he/she is cleared of charges by the court. The same views have been endorsed by National Law commission, National Commission for Review of Constitution, and Election Commission of India. But when it comes to politicians to decide about it ( Read Standing Parliamentary Committee on Electoral Reforms), the outcome Is zero. They refused this notion on the ground that the candidates may be falsely implicated in criminal cases by the ruling party. This is atrocious! They are protecting each other by posing a threat from each other. When it comes to sharing the spoils (of the nation), the present day political class is no better than a pack of wolves! The other backward classes (OBCs), who have been granted 27 percent quota in government jobs and educational institutions for being socially and economically backward, own 15.92 million entrepreneurial units, says the official Economic Census for 2005, released Thursday. People from the Scheduled Castes (SCs), another marginalised section of society with 15 percent reservation in government jobs and colleges, own 3.69 million units, while those from Scheduled Tribes (STs) run 1.52 million units, according to the 2005 data. The Economic Census released here by the Central Statistical Organisation (CSO) of the statistics and programme implementation ministry said as many as 41.82 million establishments were in operation in 2005. Out of a total of 6.08 million establishments in the farm sector, the share of OBCs was 2.81 million or 46.24 percent, while that of SCs was 0.61 million or 10.08 percent. STs accounted for only 0.38 million or 6.32 percent. 'Over 93 percent of these units owned by OBCs, SCs, and STs were in rural areas,' said S.K. Nath, director general of CSO, which conducted the Economic Census that gives not only an insight into India's economy but also intends to meet the requirements of planners, policy makers and researchers. The census says that 100.9 million people were employed in 41.83 million establishments in India in 2005, out of which 25.54 million units were in rural areas and 16.29 million in urban areas. Five states accounting for about 50 percent of total employment in organised and unorganised sectors were Andhra Pradesh (11.20 million), Maharashtra (11.31 million), Tamil Nadu (10.06 million), Uttar Pradesh (8.15 million) and West Bengal (10.03 million). The Fourth anniversary of UPA government has been celebrated and why not. The election victory in 2004 was a total surprise and even more so was the innovation that the leader of the largest single party did not become prime minister and she appointed a trusted and talented man as ‘her’ prime minister. There has been little friction between the two, and everyone knows that while he is honest and hardworking, she makes the crucial decisions. Until something goes wrong. Then he takes the blame as with the nuclear deal and with the recent inflation upsurge. But there is more to coalition dharma than just personalities. India has drifted over the last 20 years to become a softer state than it used to be. The Centre still has constitutional primacy and often uses it to mischievous partisan ends. Thanks to the fruits of liberal economic reform of the PM when he was FM and the current FM’s work with building a prudent and efficient tax collection machinery, the Centre has money to throw around at problems it is too lazy or powerless to solve — farmers deaths’, oil price rise, reservations in apex elite institutions of higher education. The money may never get there but at least gestures are made. But terrorism cannot be and will not be bribed away. Jaipur has shown how flimsy the anti-terrorism fight has become in India. Rather than worry about protecting the citizens or even finding the culprits, the first worry is to ‘avoid Gujarat’, say nothing which will antagonise the Muslim (why use the weasel word ‘minority’?) community. The simple fact is that no one is saying All Muslims are Terrorists. Only that today all, if not most, terrorist activity aimed against urban India as indeed against urban areas around the world is instigated by Muslims who have embraced the Islamist creed of Osama Bin Laden. Most Muslims are victims of this nasty philosophy as are the non-Muslims around the world. It is a lazy security service which blames Pakistan or Lashkar-e-Toiba or SIMI even before a single investigation has been carried out. In the UK, painstaking surveillance has been used to stop plots to blow people up in their tracks before the plotters get a chance. Mobile telephones and emails and websites are monitored ceaselessly to get the evidence to convict potential terrorists. Meticulous care has to be taken to search the crime scene for any and all forensic clues. One cannot afford to clean the area up for a VIP visit as often happens in India where the 10 minutes kowtowing at the feet of the VIP is worth far more for a policeman’s career than saving a thousand lives. The fact is that be it the surrender at Kandahar or the appalling and repeated incidents of terrorist activities which have occurred and will recur, nothing shames the political leadership of UPA, NDA or any other concoction. They’d much rather score points against each other than protect the public. They are safe behind their triple Z security and citizens can go hang. Even where people are caught, no one gets even presented to court much less convicted, for decades. Even in communal riots, the same sad story is told. No one can be blamed if there is a single member of any of the 200 political parties who can claim to be related to the culprit. Trials can be postponed or shifted or just botched. There is no shortage of bodies, commissions, reports, initiatives, panels upon panels of experts and yet no safety for citizens. The Centre has become non-functional in internal security as the tragic farce over Naxalite insurgency shows. Parties sympathetic to terrorists, be they Tamil nationalists of Eelam or left wing fellow traveller terrorists, can be safely in power, if not in office, at the Centre. They have only to profess to be anti-communal; to be anti-terrorist is not required. It is difficult to see when and how this situation will be reversed. If the political system is not willing to crack the whip and take internal security seriously, then no amount of new legislation or central agencies will matter. The system is divided in the way it perceives citizens. The idea that all Indians are citizens subject to the same laws has eroded since Independence. Each individual has value to the extent of the votebank to which she belongs. If you’re not part of a votebank, tough luck. Whenever general elections happen, there will be no resolution of this problem. There will be no single party majority government and another fractured coalition will take office. This coalition will also boast of some philosophy — Hindutva or secularism or anti-imperialism — but it will be stuck in the same spineless attitude about threats to internal security. Maybe there is not enough money to be made for politicians fighting internal terrorists as there is in buying defence equipment or in starting SEZs or bossing over drug companies or spending infrastructure funds. It is even more fun running the cricket board and T-20 league than in caring about hunger and food supplies. As the anarchist jibe says whoever wins the Government always gets back. Stay alive if you can. 7 pm to protest against the government's inclination to circumvent the Supreme Court's order and to save the country from any future caste wars. Please be there and extend your support to the cause. It is the high time to come together and fight this parochial and divisive politics. You can call on helpline number mentioned for more details. When the Gurjjar agitation started, knowledgeable observers had widely feared that its denouement would be something resembling war. More than 50 deaths, several districts under blockade, some virtually under a state of siege, mobile services suspended, transport interrupted, leaders unable to move freely, and a deep sense of foreboding, all suggest that the worst fears about this agitation have come true. Like so many tragedies, this one was long in the making. But no one, not the state government, not the opposition, not society at large, was willing to face up to the fact that Rajasthan was digging itself deeper and deeper into a hole. And positions are now so entrenched that a just and honourable resolution of the underlying issues seems all but impossible. The state government’s attitude to this agitation, ever since it started, has been a mixture of condescension and brutality. When the agitation first started, it did not take it seriously. When violence broke out, it bought time for itself by creating a facade of a procedure whose outcome everyone knew would not resolve the issue. Simply put, the state government was not going to recommend ST status for Gurjjars. But it did not use this window of opportunity to politically engage the Gurjjars. Rather, it thought, with condescension typical of this government, that it could buy out Gurjjars by giving them a ministerial berth or two. It says something about the state of the country that when the Gurjjars peacefully courted arrest in the thousands last year, we all breathed a sigh of relief. Peace was associated with declining momentum for the movement, and we all went to sleep. The only lesson the Gurjjars learnt as a result was that violence is necessary to get attention. The state, for the most part was stuck. Having reduced classifications for affirmative action to a power play, buttressed by a facade of a procedure, it could not move in any direction. If it gave Gurjjars what they wanted, it risked a backlash from powerful communities like the Meenas. On the other hand, it could not acknowledge that the net result of the state’s caving in to Jat assertion of power and granting them OBC status, was to send a signal to communities like the Gurjjars that the whole system was unfair. And even now the government (and the Congress) are stuck: damned if they do and damned if they don’t. Within the current paradigm of classifications, the Gurjjar concerns had some justification. But the political terrain has already shifted from reasoned argument to violence. But it would be a mistake to think that this agitation is about legal classification. The social equilibrium of Rajasthan has been under considerable stress for a number of years. Three underlying trends are particularly worrying. First, many of those killed were in the age group of 16 to 25. Access to bad-quality education has created an odd social disequilibrium: youths too educated to be satisfied with their traditional status, too untrained to participate in the new economy. Government jobs matter to them precisely for this reason. That is why they feel so much is still at stake in changing their legal classification to ST. All across North India, this disquieting possibility exists. Sub-groups within the broad classifications like OBC and SC feel that benefits under those classifications are going only to a few sub-castes. This issue is going to come to the political forefront in the coming years. When these groups get minimally educated and feel cheated that their education has not equipped them for much, a social catastrophe will be in the making. It is no accident that this agitation comes at the end of the decimation of quality higher education in Rajasthan, abetted by all parties. Second, a slow and incipient culture of violence has been spreading through Rajasthan’s villages. Arms have become more ubiquitous, paradoxically because the few who have benefited from the increasing land values need guns to protect their new riches. But in several districts like Sawai Madhopur the state has been suffering attrition at the local level. It was perhaps symbolic that one of the first people to console the victims was a prominent local “anti-social element” to use the government’s bizarre euphemism. 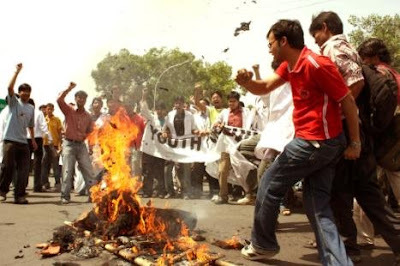 There are several districts in Rajasthan where the potential of recurring violence is increasing by the day: an odd combination of social discontent which can easily be hijacked by elements that are looking for a pretext to be violent. Finally, there is an utter breakdown of the political process. Communities like the Gurjjars do not have a leadership that can take a long-term view. They feel for their community, but have no long-term vision for expanding opportunity for them. One indication of this is their harping on one theme, that the state government send a letter to the Centre recommending ST status for Gurjjars. This is not likely to end the legal issue, nor is it likely to seriously impact the spectre of alienation that hovers over the youth of the community. The chief minister’s instinctive response to political problems is to respond with excessive force, as if the expression of any social discontent is simply a form of impunity. It is the state’s responsibility to quell violence. But it cannot do this if it does not back its might up with an intelligent political process. But the tragedy of Rajasthan is that there are very few social mediators left. It is not an accident that the chief minister has found it very difficult to reach out. The Gurjjars, on the other hand, are wary of letting Bainsala negotiate alone in Jaipur. Their last experience of negotiating was, many in the community feel, an exercise in bad faith. It is absolutely amazing that police firings are so rapidly on the rise. Even after so much experience dealing with crowds, the state has not found ways to manage them without large number of casualties. The Congress is, as always, timid at best, trapped in vague gestures of protest. In short, there is no political force that is capable of changing the paradigm within which questions of social inclusion are posed. It would be comfortable to dismiss all of this as Rajasthan’s exceptionalism. But the truth is that our politics is driving us into an explosive cul de sac. The recent, terrible violence is a reminder of what happens to societies when they can neither endure their current social condition, nor the means to overcome it. It will take extraordinary political imagination to overcome this condition. The Supreme Court on Friday vacated the Calcutta high court order staying implementation of 27 per cent quota for Other Backward Classes in post graduate courses including in the Indian Institutes of Management. "We cannot allow Calcutta high court order to operate," a bench headed by Chief Justice K G Balakrishnan said. "Can Calcutta high court sit over the order of the Supreme Court," the bench asked while vacating the stay. The bench said that when the apex court had upheld the validity of the act providing the other backward class quota, where was the question of high court staying its implementation. 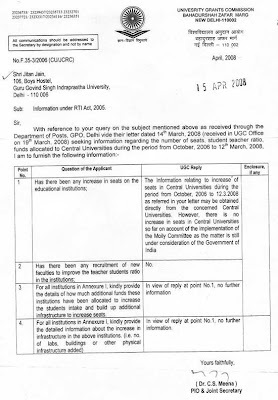 However, the court said, subject to the final outcome of the matter before it, all admissions will be provisional in post graduate courses in central educational institutions under the act. The court stayed all proceedings relating to the OBC quota that are pending in the high Courts of Delhi, Calcutta and Bombay. It also issued notice to those petitioners who were opposing the implementation of government memorandum in different high courts on the Centre's petition seeking transfer of those matters to the apex court. Today Mumbai High Court issued notice to the Government on the matterof implementation of OBC quota. The next hearing is scheduled on 23rdof June. The HRD Ministry sent its attorney for the hearing. 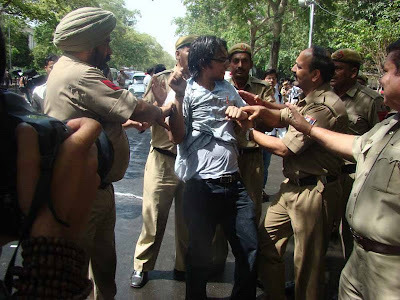 The IIT-Band TISS lawyers were taken the view of Delhi High Court and soughttime to file answer. This is natural procedure as the court is goingto hear both sides before pronouncing any order. Calcutta High Court is supposed to take the matter today as the HighCourt is approaching its summer break. Yesterday only our lawyersargued in front of the Division Bench to take the matter for earlyhearing. Justice Maharaj Singh had agreed to take the matter for anearly hearing. On date 13th May 2008 the National Commission for Backward Classes wasbusy hearing the plea from the Jat Community of Delhi that they arethe real backward caste and deserve reservation. There was virtuallyno opposition except that of Youth For Equality's representation alongwith Ati Pichhda Varg Sangharsh Samiti. The house was full of Jats ofall age. YFE representatives Amit and Vikram had to struggle to enterand submit the representation infront of the Commission. Surprisinglythe Jats were degrading themselves infront of the commission andinfront of their own community. Only one opposition came along withYFE and the person was abused by the members of Jat community. Theperson had to say "look at them Mr. Chairman (Justice Ratnavale) howthey are behaving. If they can abuse me infront of the Commissionimagine what they can do at the village level. Do they look backwardfrom any angle". How disgusting a situation it was to see and hearthat powerful communities, one after another, taking pride indegrading their own self to get the benefit of reservation. VikramSingh, who was standing beside the podium, had allowed others to hearthe public hearing through his mobile phone. When the writer of thismail arrived at the Commission Amit and Vikram were flexing muscleswith the Jats present their to make their point. Finally we had torush to the personal chamber of the Member, NCBC to present our view. Now the Government is on its toe! 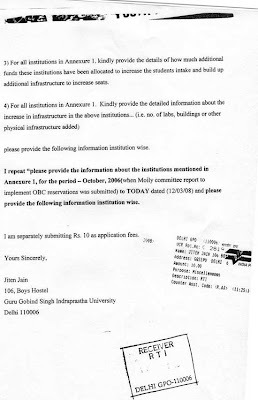 The Honorable High Court of Delhi issued notice to the Centre asking to answer questions taken by the petitioner. The Court has given four weeks time to the centre to file its answer. After that the court will decide on the fate of the order. In between we are going to file another set of petition at the Delhi High Court covering other issues. Senior Advocate Harish Salve appeared for our petition and tasked the government to answer the questions posed by the petitioner.In Mumbai the scene was quite different. The defence lawyer was caught unaware and admitted to deferred the result of Tata Institute of Social Science for fifteen days to facilitate the Court to give its verdict. The TISS lawyers have asked for a copy of the judgment to read and come with an answer. Day after again the hearing will be resumed at the Mumbai High Court. The High Court also ordered the petitioner (Youth For Equality/Doctors For You) to sent one copy of the petition to the HRD Ministry with immediate effect. Ad. Anil Joshi appearing for YFE prevailed at the High Court. Our Mumbai YFEians have already dispatched a copy of the petition without losing time. Tomorrow the Calcutta High Court will take the case. Our friends there working overtime to appear at the Court. Also tomorrow another important presentation to be made infront of the National Backward Classes Commission. Amit Srivastav and Vikram Singh will be appearing before the public hearing in front of Justice Ratnavale at the NCBC to oppose the inclusion of Jat in Delhi in Central List as backward caste. The hearing will be resume at 11AM. Vikram and Amit are representatives of Delhi based ATI-PICHHADA VARG SANGHARSH SAMITI. They will present the view on the said samiti's behalf. YFE is also going to make a presentation along with Citizen For Equality. This is the time to stand for the cause and get yourself counted. The government is trying to fool everyone. We need to challenge them. This is your time. Please come forward and support the movement. Remember actions are always of greater value than giving mere reactions! “How far that little candle throws his beam! So shines a good deed in a weary world” so said William Shakespeare. What Youth For Equality has aspired was good deed in a weary world! The OBC Reservation in the present context is nothing sort of organized loot by the most powerful community of the society. The Supreme Court Judgment regarding the OBC reservation tried to put a permanent break – gradually! As the five judge constitution bench was not unanimous in their opinion, majority judgment is what going to be counted. In his judgment Justice Raveendran said “To start with, the effect of reservation may appear to perpetuate caste. The immediate effect of caste based reservation has been rather unfortunate. In the pre-reservation era people wanted to get rid of the backward tag -- either social or economical. But post reservation, there is a tendency even among those who are considered as 'forward', to seek 'backward' tag, in the hope of enjoying the benefits of reservations. When more and more people aspire for 'backwardness' instead of 'forwardness' the country itself stagnates. Be that as it may. Reservation as an affirmative action is required only for a limited period to bring forward the socially and educationally backward classes by giving them a gentle supportive push. But if there is no review after a reasonable period and if reservation is continued, the country will become a caste divided society permanently. Instead of developing an united society with diversity, we will end up as a fractured society for ever suspicious of each other. While affirmative discrimination is a road to equality, care should be taken that the road does not become a rut in which the vehicle of progress gets entrenched and stuck. Any provision for reservation is a temporary crutch. Such crutch by unnecessary prolonged use, should not become a permanent liability.” There are certain very promising points in the judgment pronounced by majority of judges. 1. Exclusion of Creamy layer. 2. A person is not educationally backward if he becomes a graduate. This means there should not be any reservation for OBCs in Post graduation. 3. Merit has been recognized by the Supreme Court in no uncertain terms. 4. Unfilled OBC seats in absence of qualified OBC candidates will go to general category candidates. 5. Unaided institutions are out of quota purview. 6. Importance of Primary Education in place of quota has been established. The Government is of the habit of misreading the judgment and sabotaging justice. Youth For Equality is planning to file a series of petition in case the government try any kind of dilly dallying with the just implementation of the landmark judgment. 1 Creamy layer is out. 2. Educational forwardness is defined and no quota beyond graduation. 3 No reservation in unaided institutions. The Govt will have to declare the identification criteria for SEBCs, which will be open to Court scrutiny. Why the court did not struck down the amendment or act? It would have created another set of political onslaught on the judiciary and could have lead to another amendment or another act with foolproof measures! What we have got out of this judgment? The judgment is for eternity! We can refer to this judgment for various purposes. Apart from what is above - Justice Pasayat/Thackker and Justice Bhandari categorically said if there is more than 50% matriculate or +2 available in a particular caste that caste must be removed from the list of backward category. Justice Pasayat in his para 122 said: AIIMS is a centre of excellence so must be exempted from Quota! Apart from meeting the senior lawyers to decide the future of the case we are keeping an eye on the political development. We have sounded our IIM friends at IIM - Ahemadabad and IIM-Bangalore to remain alert to any malafide intension of the HRD Ministry. The IIM has not yet got any official communication to implement quota! If and once they got it we are expecting a Fax copy of the same to produce it at the Court! We are specific to take the matter to court if there is any sabotage of the court order and no one may remain ambivalent on that. The Government is harboring a habit of saying all court order as Obiter Dicta (advice)! They have said so during the 9th schedule judgment and during the Stay order of this reservation also. Justice Pasayat told in no uncertain terms in the past that "In 1989 I became a judge of Delhi High Court. Since then I stopped giving advice. I only give order!" We must remain patient and contribute whatever way possible. Today only a cabinet meeting is scheduled! Our friends from IP University are in touch with the national and international media to track place and development of the proposed meeting! Much is needed to be done! All are requested to remain vigilant and prepare to take responsibility. 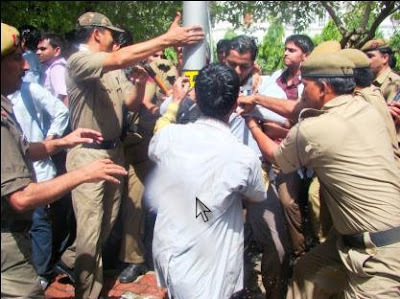 The supporters of the quota are ruthless and going to the nasty extent! We have to remain offensive as defense is more difficult than offence. Please note the following change in the contacts of Youth for Equality, Mumbai. Feel free to contact if you have any queries or suggestions. Even though the Supreme Court allowed 27 per cent reservation for the OBCs in Central educational institutions, it has raised questions on the effectiveness of such a policy for bringing equality in the society. "There is no deletion from the list of other backward classes. It goes on increasing, is it that backwardness has increased instead of decreasing? If the answer is yes, as contended by the respondents (Centre and other pro-quota parties), then one is bound to raise eyebrows as to the effectiveness of providing reservations or quotas," Justices Arijit Pasayat and C K Thakker said. "The inequalities are to be removed. Yet the fact that there has been no exclusion raises a doubt about the real concern to remove inequality," he said while pointing out that since the concept of OBC came into picture there has been no deletion of any caste from the category. The SC asked the Centre to deliberate whether the reservation policy followed since Independence had been effective in achieving the desired result. "If after nearly six decades the objectives have not been achieved, necessarily the need for its continuance warrants deliberations," the SC said. "It is to be noted that some of the provisions were intended to be replaced after a decade but have continued. It directly shows that backwardness appears to have purportedly increased and not diminished," the judges said adding that the affirmative action had got somewhat complicated in India on account of caste politics. First of all YFE must celebrate the judgment with champagne! What has happened during the last 14 hours! Judgment came at 10.30! Utter confusion prevailed among YFEians! Senior Advocate K.K. Venugopal summoned to his Supreme Court cubicle! Spoken for 30 minutes and looked very encouraged! Volunteer to fight the case for the nitty gritty! Harish Shalve was happy and deciphered no quota at P.G. Level. Sri Sri Ravi Shankar called and committed to support YFEians. Prof. R. Srivinas from Mumbai called and expressed full support in any form. A group of lawyers volunteered to study and come with a series of question and review petition to be filed soon! Dr. Shiv Choudhary, now in US, spoiled his sleep and gone through the verdict 370 pages and sent his feedback and directives! Prof. Indiresan and Dr. Binod Khaitan reached to the media with the most calculated version of YFE response! More is happening and the YFEians working overtime! The countdown has begun! YFE has got more than what it demanded! Educational Forwardness has been defined by the Supreme Court and the redefinition of quota politics is in vogue. A Graduate is no more backward - the out come of the verdict - Majority judgment - no quota in Post Graduation education! There are other thing in this judgment. Justice Ravindran's judgment has not yet been uploaded! Tomorrow the collective conclusion and Ravindran's judgment will be collected from the SC and to be scanned and send to all! For the first time educational forwardness has been taken into consideration and it is an idea of YFE! The sound bite quota for Creamy Layer by the political class fall flat! YFE welcomes this! Merit has been accepted as the most paramount factor in education! The difference between general and quota candidate must not exceed 5%! Identification will be more stringent and specific! No quota in private unaided educational institution and this is final! What YFE will and must do in future! Tell the civil society - they want excellence - better doctors, engineer, teachers or intellectual pigmy! When politics decide your future, decide what your politics must be! Fighting election is no more an option but must be an unavoidable reality! There is strong undercurrent of unrest all over the country! YFE must capture this dissatisfication! At the legal front there must be a series of petition on each and every irrational issues and who knows such kind of gifted judgment we may get! All are requested to work for YFE in some form or in other! Contribute in any possible form and volunteer to work for the upcoming petition, election, social work, research and maintaining the high morals! The time has come to raise our heads over the stormy water! YFE never started to get satisfied with a verdict favorable or otherwise! The destiny of the nation must be changed by us only! If the time has not yet come - LET US PREPONE IT! Celebrate and prepare yourself as a tough battle lies ahead. In the landmark judgement today YFE has been vindicated by the Honourable Supreme Court. 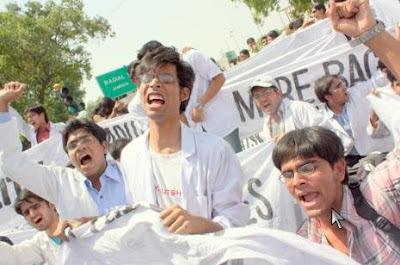 No OBC quota in IIMs, AIIMS. As soon as we get more details that will be posted on this site. The fate of the 27 per cent quota for Other Backward Castes (OBCs) in higher educational institutions will be decided by the Supreme Court on Thursday. The apex court will decide whether the Centre was legally right to provide OBC quotas in higher educational institutions like the Indian Institutes of Technology (IITs), Indian Institutes of Management (IIMs) and All India Institute of Medical Science (AIIMS). The court had put the quota on hold in 2007 after several petitions challenged it. The key objection in the case is that the government based the quota on a 1931 survey. The petitions also say that the creamy layer should not get reservation benefits and that the OBC quota will divide the society. 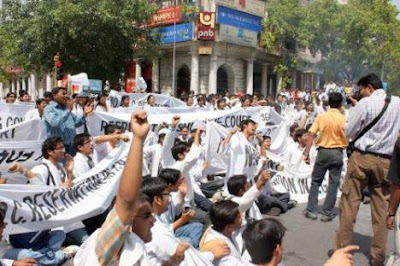 The OBC quota proposal had even led to widespread protests both for and against. However, the 27 per cent quota was passed unanimously by Parliament. Now, if the court gives the go-ahead, the 27 percent quota could be implemented from 2008. This is to bring to your kind attention that one of the most prominent face and active member of YFE Mumbai, Vinit Shah, met an unfortunate accident in Panvel on 19/12/07 and succumbed to the injuries. Youth For Equality prays for the family of deceased. May God gives the family of Vinit, courage and strength in this difficult time. May his soul rests in peace. This is the one of the post of Vinit, which appeared in New Mumbai Times recently. Irked by ugly looking hoardings, a Panvel resident filed a Public Interest Litigation (PIL) against the state, municipal corporations of Navi Mumbai, Thane and Mumbai in the high court. The case was called for hearing recently, in which chief justice Swaeanter Kumar has asked the government to frame a policy to curb this hoarding menace. 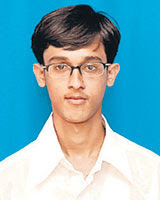 Vinit Shah, the third year student of Bio-technology from DY Patil College, who went to court against hoardings, said, "Final verdict in the case (registration no is PIL/111/2007) is still awaited. I am, however, happy with the way the case has unfolded so far." When asked why he lodged a PIL, Shah said, "Navi Mumbai is a new city and the hoardings are making it look ugly. Hoardings of politicians' birthdays, festive messages, etc are very irritating. These hoardings spoil the city's beauty and the messages are also irrelevant for most of the residents." Shah, who runs Manavta Parmodharma Youth Organisation adds, "We used PIL as per the advise of our advocate HS Venegavkar. The hoarding menace needs to be discouraged, but in a legal way. Sources allege that most of the politicians never pay a fee for hoardings, which is terrible." Hoardings put up during the festive season can be annoying at times, but does the city really crave to get rid of these hoardings? New Bombay Plus finds out..."During festivals and otherwise also, there are so many hoardings put up weirdly. They take almost two feet space from the road, which is already quite narrow. Especially in the night, when vehicles enter Vashi, near Vashi Plaza, the banners are vaguely placed," said Nitin Patil, a Vashi resident. Some people have objections against brightly coloured hoardings. According to Amit Gupta, a Nerul resident, "After Vashi toll naka, there are many hoardings that are too bright and irritating while driving." However, for societies that shelter these hoardings, it's a boon. In Vashi Shivaji Chowk, near Vashi depot, the buildings that host hoardings make big money. According to Amardeep Singh from Ronak Advertising agency, "Generally, for 40/20 ft size hoarding, we pay about Rs 40,000 to 80,000 per annum, though rates vary, depending on the location. Usually, we book buildings for about 5-7 years, but from the past few months, NMMC has stopped issuing permission for the hoardings. There are societies that still approach us, as they also make good money out of hoardings." When asked, secretary Dr SH Thorat from Arti society in sector 2, Vashi said, "In Mumbai, there are so many societies that are making crores of rupees through hoardings. We only make a few lakhs from it." However, there are societies, which have given applications for hoardings. Says Mahendra Kumar, a resident from Basera Society in sector 17, "If hoardings can save the money for society maintenance, then I have no problem in supporting it. Most of us would be happy to save money as society maintenance is increasing almost every year." According to J Patnigire, deputy municipal commissioner (encroachment), "NMMC has already stopped issuing permission for hoardings. However, during festivals, temporary permissions are issued." About the case, Patnigire said, "The matter is in court and it would not be right to comment on it." Navi Mumbai is a new city and the hoardings are making it look ugly. Hoardings of politicians' birthdays, festive messages, etc are very irritating. These hoardings spoil the city's beauty and the messages are also irrelevant for most of the residents. The Addl. Solicitor General Gopal Subramaniam started his arguments to prove the irrelevance of US judgment in the Indian scenario. He asserted the role of executive and legislative measures to ensure social justice by bringing all the backward castes in main fold. Taking the limelight away from the admissions issue, he repeatedly voiced the need to implement the fundamental right to equality enshrined in Part III of the consitution in its totality. Justice Pasayat and Justice Thakkar expressed their concerns and apprehensions over the inadvertently long delay in attaining the objective through the quota route. To this, ASG retorted by expressing inability to find quick fix solutions to treat this age old malady and supported the quota and reservation system as the best form of special provision. Then YFE counsel Rajeev Dhawan argued with the Chief Justice, to prove that the present form of quota is untenable and cannot stand judicial scrutiny. He said the modality taken for identification, for offering benefit and the percentage of reservation must be redefined. ASG urged the need to view concept of equality from different perspective, which according to him, Equality means parity in condition and parity in treatment. Gopal Subramanian's arguments full of loop holes had little impact on the judges. While countering YFE's presentation on Arjun Sengupta Report, the ASG armed with the full report, was caught on wrong foot when Justice Raveendran quizzed him on the data. Later Andharjuniad (Albanian origin lawyer) on behalf of Kerala Government, Mrs. Indira Jaising for Andhra Pradesh Government put in their arguments. Mrs. Indira's argument was based more on historical past rather than present scenario. The court is now reconvening on 23rd of October as the full bench of the judges is not available for that week. Ram Jethmalani will argue for the government on 30th. Having known their stand on most issues, we need to prepare a strong counter point. Your inputs are appreciated and needed. Download and circulate the YFE Signature Campaign: Click here. In case of download problems, send us an e-mail and state "I want the signature campaign" in the subject. YFE Mumbai has created a slideshow to give an overall picture of the rationale behind the movement. Two versions - one with sound and the other without sound are available. No sound version: Click here. Copy the folder "Audio" to your C drive, such that a folder "C:\Audio" exists. The powerpoint presentation will access the sound files from this folder. Due to the enormous numbers of e-mails we receive, we may not be able to reply to all mails; but be assured that we read each mail and will incorporate all valuable suggestions.